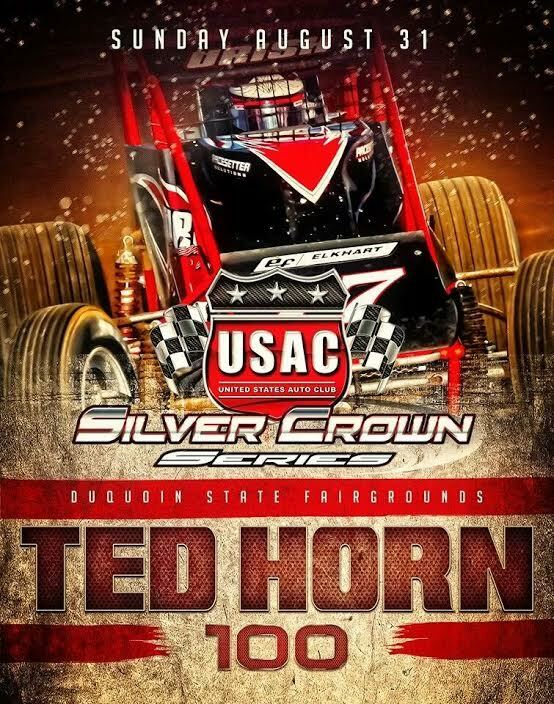 DuQUOIN, Ill. – Get ready for some racing Sunday, because track preparations are underway for the USAC Ted Horn 100 for USAC Silver Crown cars at picturesque DuQuoin State Farigrounds. The 100-miler on the DuQuoin Mile is the opener of a doubleheader and part of the dirt track Labor Day tradition. We are racing in DuQuoin! Grandstands open at 4 p.m. Sunday with practice at 5, qualifications at 6 and racing at 8. UMP modifieds will also run heats. A loaded field of USAC cars is expected, and come watch the stars and cars of the USAC ranks race under the lights from the gorgeous DuQuoin grandstand. Chris Urish is the defending champion after an unpredictable race last season. The DuQuoin State Fair is also underway, so it’s a family destination. Have fun in the campgrounds located on the fairgrounds. On Monday, Ken Schrader is the defending champ of the Southern Illinois 100 for ARCA stock cars. Practice begins at 9 a.m. with qualifying at 11:15 and the race takes the green flag at 1:30 p.m. The Modified feature is at noon. For more information, go to trackenterprises.com or call 618-542-1515.